Happy birthday, iMac. The ground-breaking all-in-one was launched on May 6, 1998, at a Macworld Expo by Steve Jobs. I’ve owned every iteration of the iMac since then, so I’m expecting Apple to give us a cool new version any day now. The first all-in-one had a radical (for the time) design (by Jony Ive), a CRT monitor, motherboard and CD-ROM drive housed in a colorful translucent egg-shaped housing, versus the more traditional desktop tower tethered to an external monitor. It packed a 233-MHz PowerPC processor, a 4GB hard drive and sold for $1,299 in the U.S.. Despite the May unveiling, it didn't ship until August of that year. Since the iMac G3's 1998 debut, Apple has introduced several revisions to the desktop machine, launching design revisions in 2002, 2004, 2007, 2009, 2012, and 2015. So what can we expected from the 20th anniversary iMac? A major form factor redesign would be exciting, but I’m not anticipating one (more on that, in a sec). What I AM anticipating is a “non-Pro” iMac available in space grey (and, less probable, in a hue of colors). I also expect some other iMac Pro features to come to the non-Pro model, including better speakers and an enhanced FaceTime camera. The iMac Pro also has the first ever 1080p FaceTime camera to come on a Mac, compared to the 720p camera on the 5K iMac. It also has four microphones, compared to only one on the 5K iMac. This needs to change. And here’s hoping Apple brings Face ID to the Mac. The chances of Apple choosing OLED for the iMac 2018 display is very slim since the technology is still in the developing stage. Which means, it would be quite pricey for a 21-inch or 27-inch monitor. On my wish list (though I don’t think it will happen) is the addition of dual cameras on top of the display. Dual cameras would make 3D facial recognition possible, and could even be used to capture 3D video. Not only could our FaceTime chats take on a deeper, richer experience, but 3D capture could help those who have difficulty interacting with their computers. Dual cameras could more easily track eye and facial gestures allowing for much more precise input for those who need this type of interaction. 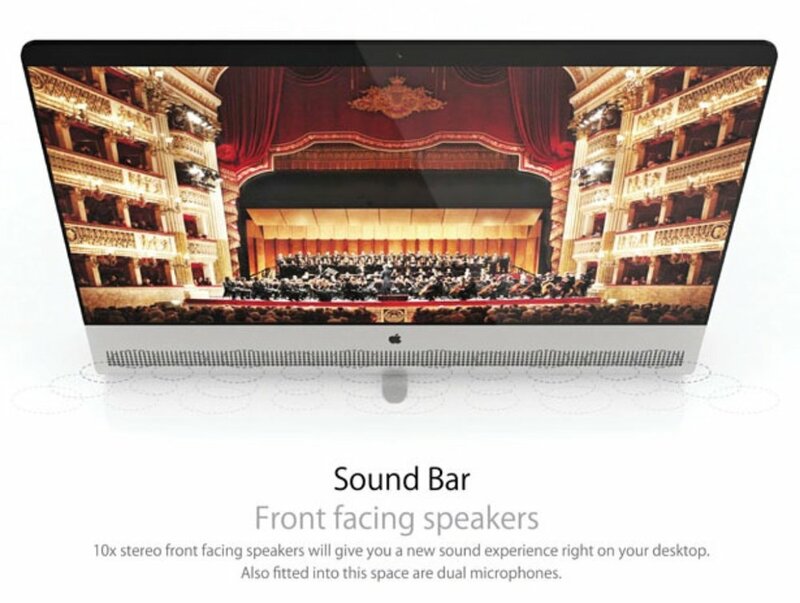 A whole new way to interact with the iMac would be possible. As for accessories, I expect to see an optional Magic Keyboard with a Touch Bar offered for the iMac. And since Apple has repeatedly said there won’t be a touchscreen on a Mac, I’d love to see an optional, super-sized Magic Trackpad with Apple Pencil support. As for specs, I think Apple will use Intel’s Coffee Lake CPUs, so we’ll see an iMac 2018 with a six-core processor. Graphics-wise, the iMac will probably stick with AMD’s Vega graphics cards. However, with the arrival of AMD's 2700X 4.3GHz 8-core CPU, this could be a good time for Apple to make the move over to AMD's Ryzen collection. The current iMac has had the same design since 2012. Apple may make some internal changes that slim the all-in-one down even more — and perhaps shave off some of the “chin.” Or, if Apple really believes in the Touch Bar, it could add one to the all-in-one’s chin.